Last time I was in Jakarta, BBC Indonesia invited me to play Komodo Ping-Pong live on their Facebook channel. It became a fun experience with everyone in the studio helping me to sing on the chorus. Finally I have the pleasure of releasing a new song for you all. Also this time it's inspired by my first travel to Indonesia in 2016: Komodo Islands! This song is my second tribute to Indonesia after my traveling here. We spent a couple of days in a small village called Moni, located by the foot of Mt. Kelimutu. I'm inviting YOU to record your own version of "Nasi Padang". Upload it to YouTube or Soundcloud, and post it on my Facebook Page. I will share my favourites on the page. This summer I was traveling in Indonesia for three weeks. It was one of the best travel experiences I have had so far. A country with beautiful breath taking nature, colorful corals, welcoming and generous people, and last but not least the amazing food! On my last day in Jakarta, I tasted Nasi Padang. 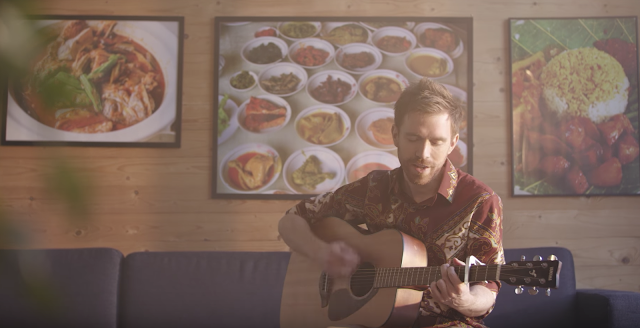 It was the best meal on the trip, and when I came home to Norway, I decided to show some love back to this amazing country and made this song as a tribute to Indonesia and Nasi Padang. Feel free to share the video and song with friends! After you have heard it, you can decide if you want to donate anything. All support it much appreciated but what's more important is that you enjoy the song, and hopefully makes you smile.